Helpful Effects of My Actions: How are my actions helpful and productive? Harmful Effects of My Actions: How are my actions hurtful or counter-productive? 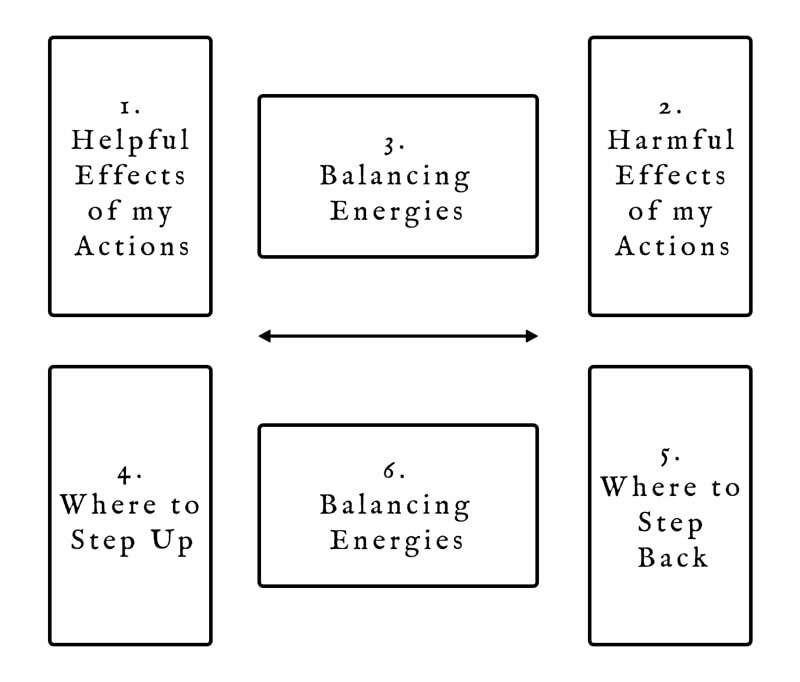 Balancing Energies: Energies/strategies to balance these consequences. Where to Step Up: Where and how can I do more? Where to Step Back: Where should I step back or take a break? Balancing Energies: Energies/strategies to balance action and rest. How to best keep balance between action and inaction, productivity and rest? We have at least two distinct applications for this line of questioning in the context of resistance work. This first goal is to stay active and engaged without burning out. We can’t make ourselves too comfortable and veer into laziness or timidity when there’s so much work to be done. However, it’s just as important to rest and pace ourselves so that we don’t get sick or burn out, losing the ability or heart to play our respective parts. The second goal is to choose our battles wisely, while keeping our egos and blindspots in check. No single person has the perspective, talents, knowledge, time, or strength to jump on the front-lines of every battle. Taking on the wrong tasks at the wrong time can cause more harm than good to one’s self, one’s community, and the given cause. There are places for each of us to raise our voices (step up), and places where the best we can do is take a seat and listen respectfully to others’ leadership and experiences (step back). Acing any balancing act requires constant correction as we teeter to either side of our center. Balance is an ongoing process, impossible to get perfectly right. We improve with practice, intention, and reflection, but even with competence and the ultimate goal of mastery, it’s best not to expect perfection. If you find yourself veering too far in one direction—hiding in your comfy bubble, or else breathing so much fire you become a hazard—remember you’re only human. To engage at all is to err at least a little. Become aware of where you’re at, and re-center. Take responsibility for any missteps, then correct yourself and keep going. The balancing cards should offer some insight here. Pay attention to which direction the balancing cards point. Read these horizontal cards as upright, and look at how the energy flows between the two cards on either side. This may have something to tell you about the direction you need to move in to get back on track. The dominant elements behind this spread are fire and air. It’s all about blending the right amounts of action, will, and passion on the one hand, with clear thought, rational analysis, and insight on the other. Fire (action) needs the right amount of oxygen (thought/intention) to burn. With too little air, it smothers out; with too much, it blows out, or worse, spreads uncontrollably. Attach great passion, courage, and will to the wrong contagious ethos and nations burn. Conversely, air (thought/intention) with too little fire (action) is unbearably cold. With too much fire, air is poisonous to breathe. Either way, it can’t support life and growth. Helpful Effects of My Intentions: How are my motives helpful and productive? Harmful Effects of My Intentions: How are my motives hurtful or counter-productive? Where to Step Up: Where are my motives most pure and affective? What thought patterns are worth supporting and developing further? Where to Step Back: Where do I most need to correct my thinking? Where might I have a blind spot, a chip on my shoulder, and ego run amok, or a stale or inaccurate belief? 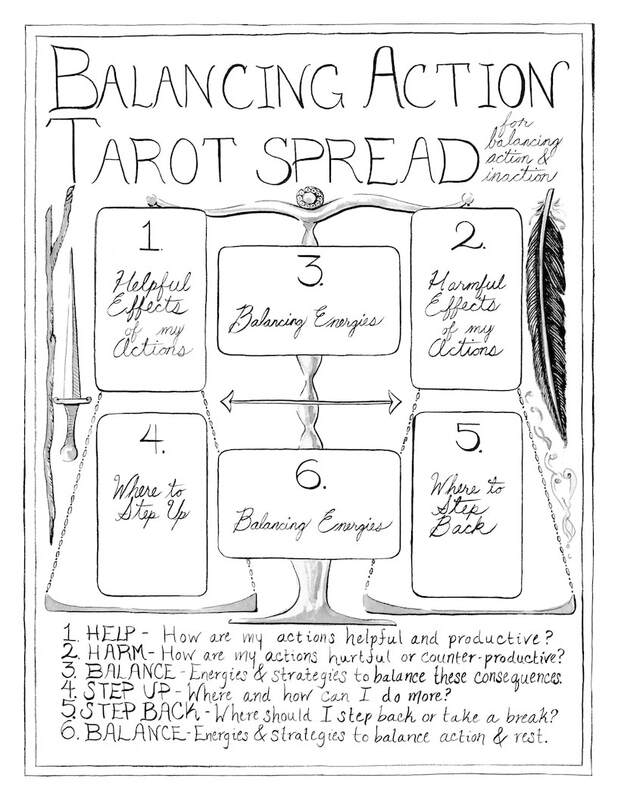 Balancing Energies: Energies/strategies to balance beneficial vs. troublesome intentions. Try two side-by-side readings, one of your actions, and one of your intentions to see how well they align. • Creativity: Edit and polish your creative projects without overworking them or crushing their spirit. Each card’s exact phrasing will vary depending on your medium and the stage of your process. For example, if your medium is unforgiving like ink painting, and you fear overworking a composition near completion, you might phrase the cards’ questions like so: Which of my actions improved the piece? Which of my actions detracted from it? In what ways can I keep working? Where do I need to step back? If, on the other hand your medium is infinitely flexible like writing, and you haven’t yet begun editing, you might phrase things a little differently: What are some helpful ways to approach my editing process? What methods might be harmful or fail to serve the project? What area of this project needs the most editing? What parts should I leave alone or touch minimally? These are just examples. There are many itty-bitty ways to tweak this spread towards editing, and of course, not all projects will call for tarot help. Trust your eye and your taste! • Career: Our culture values productivity disproportionately over character, wisdom, and quality of life. This is a great spread to use when struggling with workaholism, work/life balance, and prioritizing between day work and labors of love. • Relationships: Emotional labor is a thing. Check your balance between the investment, action, and emotional labor you pour into your relationships, and the self-care, solo time, and breathing space you need to keep yourself happy and healthy.